The BBC has a report on a massive new tidal power turbine destined for a Scottish test site - Largest tidal power device unveiled. 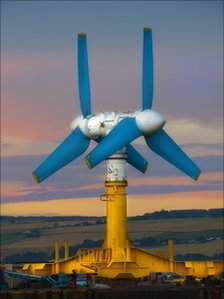 A device thought to be the largest tidal energy turbine to be built in the world has been described by its developer as "simple and robust". Atlantis Resources unveiled its AK-1000 at Invergordon ahead of it being shipped to a European Marine Energy Centre test site off Eday, Orkney. Chief executive Tim Cornelius said it was designed to survive in a harsh marine environment. The device stands 22.5m (73ft) tall and weighs 130 tonnes. It has two sets of blades to harness ebb and flood tides and could provide electricity for about 1,000 homes. Mr Cornelius told BBC Scotland that the focus of the marine industry at the moment was making the Pentland Firth a huge success in terms of generating electricity from renewable energy devices. 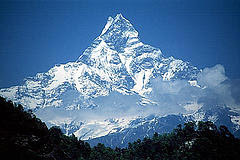 Mr Cornelius said: "It is one of the harshest environments on the planet. In order to get a robust turbine we have had to make what we call ultimately the dumbest, simple but most robust turbine you could possibly put in such a harsh environment." The AK-1000's two sets of blades have also been designed to move slowly underwater and Atlantis said they would not pose a threat to sea life. Mr Cornelius said: "The turbines turn at six to eight revolutions per minute so are incredibly slow turning and will have zero impact on the surrounding environment."